This is my favorite musical ever. And I always cry at the end. No lie. 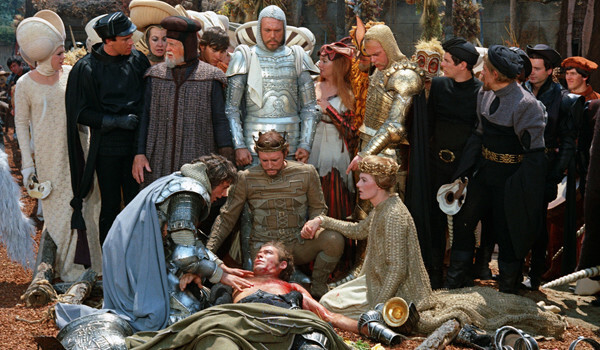 Camelot is all about great hopes dashed to the ground, and it gets me right there. I love the soundtrack, I love the movie, I make no apologies for any of it. Well … maybe for the costumes. They’re kind of just … long ye olde-timey sacks. 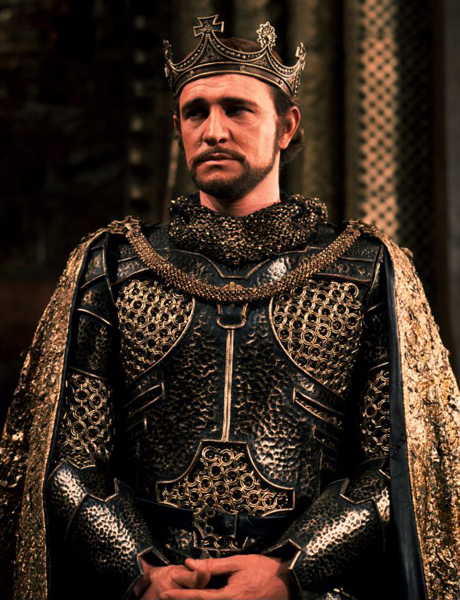 Though I guess I shouldn’t judge Camelot‘s costumes too harshly because King Arthur is really more of legend, not a strictly historical story, and it’s not like this musical is set in a specific year. Those Arthurian legends put him as having lived in the late 5th and early 6th centuries in Britain, while most of the texts written about King Arthur date from the 11th and 12th centuries. So the story gets some flavor of the later period too. 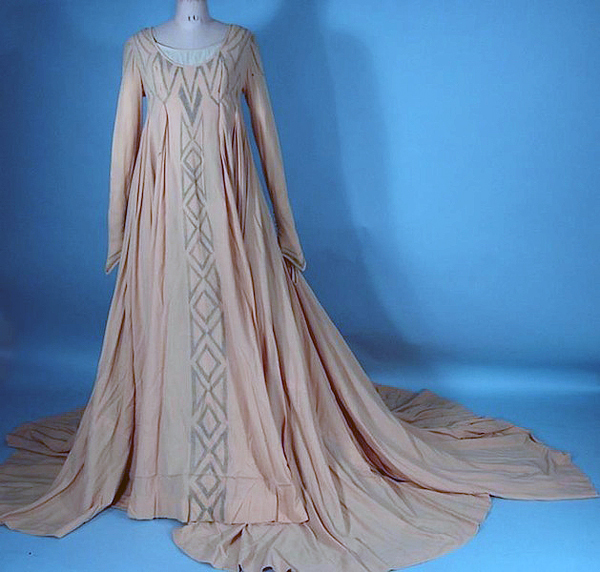 All that said, authentic 5th- through 12th-century clothing in the British Isles looks a whole lot like sacks to me. Also, and more importantly, these are medieval sacks via the 1960s. This is more evident when you see the actual costumes on display vs. on the screen. The fabrics scream “polyester double-knit,” and all the bouffant hair and doe-eye makeup is obvious. Designer John Truscott won a Best Costume Oscar for this film, and, well, let’s just say it was of its time. Still, it doesn’t hurt the performances or the songs. It’s the most ferocious, savage, terrifying forest I’ve ever seen. I simply adore it. This is the time of King Arthur when violence is not strength and compassion is not weakness! Was there ever a more inconvenient marriage of convenience? The men she held so dear / Go to war for Guinevere. 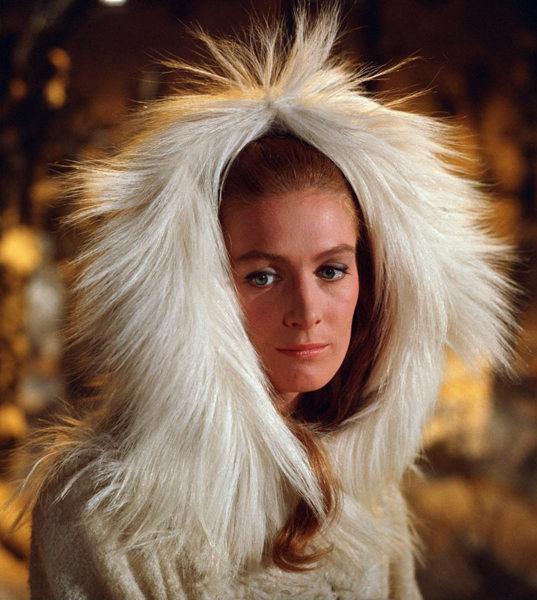 Costume worn by Vanessa Redgrave as Guinevere. Probably an underdress worn by an extra. Costume for a lady of the court. 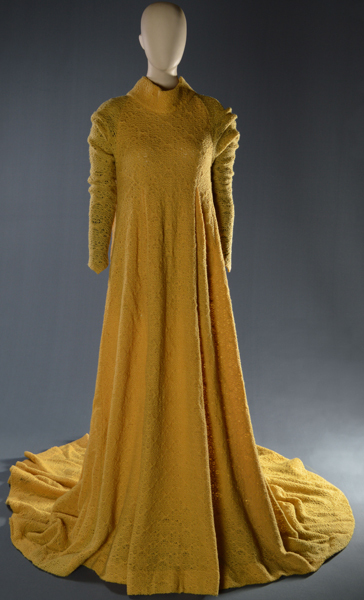 Gown worn by a woman in a court scene. 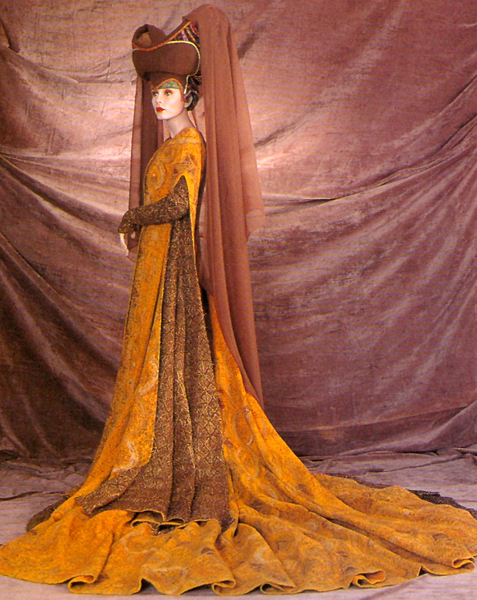 Gown & headdress worn by a female extra. Don’t let it be forgot / That once there was a spot / For one brief shining moment / That was known as Camelot! OMG! You missed the whole design point and the era in which it was made, the impact on fashion and the bleed back. 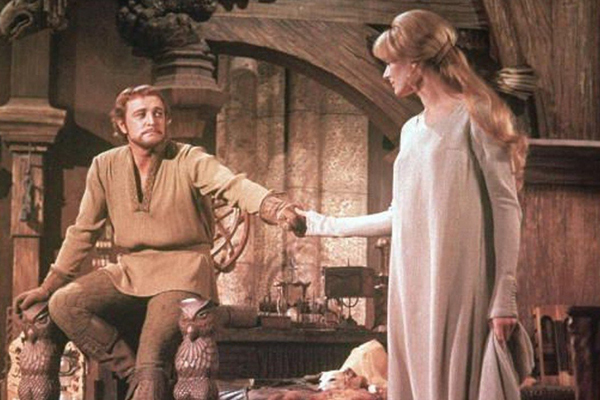 Camelot is a parody of Arthur, not just a celebration. That is reflected everywhere. The influence of mod on every dress and the introduction of art nouveau as it started to permeate free love culture and couture. Also the way they traditionally filmed musicals. The detail in every dress. 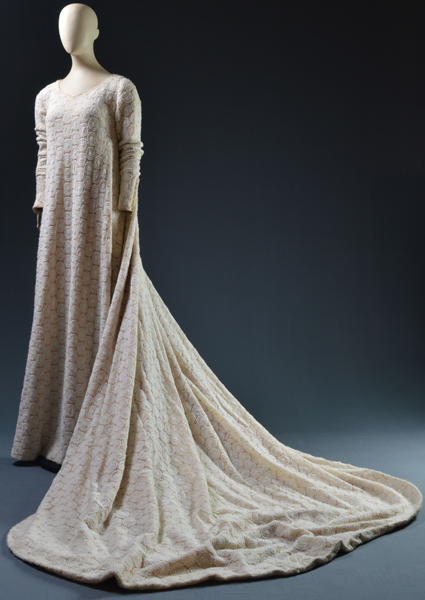 The merry month of may Guenivere dress is straight from Mucha. This is an amazing stylised production that captures the time, the free spirit, the optimism and ultimately the doomed cynicism of the era. Created in 1960, the centre of the Kennedy era and then the movie in 1967 made as a poignant look back at lost hope and its reincarnation in the peace movements of the time. This movie effected fashion for the next 6 years, even going so far as to inspire the Gunne Sax label which ruled the prom dress scene until the early 80s. 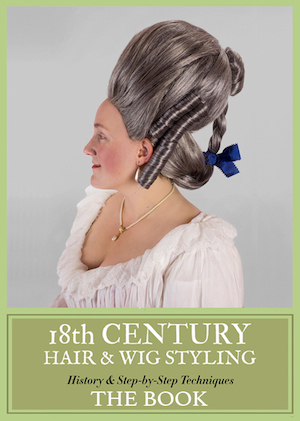 It may not have been historically correct but it made fashion history. You’ve reminded me that it’s almost May! That means I dig out my original Broadway recording and sing along in the car! Yes! Give me Andrews, Burton, and Goulet over Redgrave, Harris, and Nero any day. Not just of it’s time but the next 15 years plus. I know you are just defending a friend but the three paragraphs did not do service, even as an opinion piece to the design, costumes or its impact on culture. 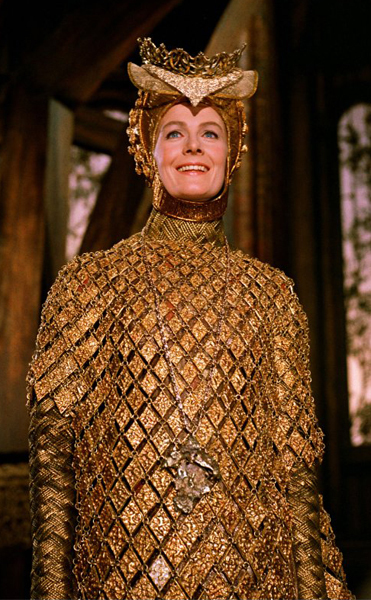 Describing the costumes as “long ye olde-timey sacks” did not do justice to the level of detail; the plate mail dress, the collar of the gold dress, the embroidery of the wedding dress…This was a throw away piece and I am disappointed. It may make me un-popular.,.oh well. Did not actually say that. Please don’t put words in my mouth. And the above comment was to one that told me off less graciously, and was unfortunately, or fortunately removed while I posted my reply to it. This happens. If you are swamped why not try something novel? Post a movie and ask your audience to each take a piece or costume and review it. Or post a fact that they think no one else has ever heard of. I loved it. Movie and costumes. Especially Guinevere’s. I agree with Abigail Tyrell. The whole thing screamed Art Nouveau, sixties, Anti-war movement and love power (I know that’s a title of a song from the Producers). It influenced more than fashion. We still speak of JFK’s presidency as ‘Camelot’. But my favourite musical movie is a draw between My Fair Lady and The Sound of Music. I too, loved this movie. As a teen when I first saw it, the wedding scene when they walked up the aisle with Guinevere in that gorgeous dress was just sooo romantic! I thought the costumes appropriate for the most part, especially King Arthur, he did look so good in the picture you’ve shared. Time to pull it out again, haven’t watched it since before Christmas since I haven’t done any sewing since then. The family chuckles and shakes their heads when I pull it out…they think it’s cheesy. They’ll never understand. Run boy…..
One of my favorite memories from high school is when I was a part of my school’s production of Camelot. I love the music!! Years ago I saw an exhibition of movie costumes at the Met in NY. 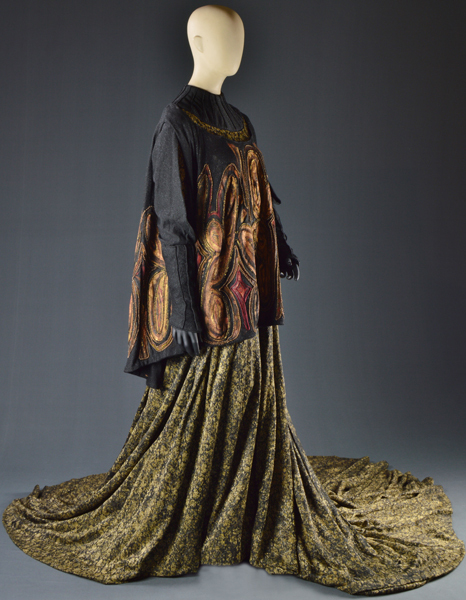 Included were movie costumes from the earliest silents to contemporary film. Of all the costumes in that show there were two that particularly blew my socks off. One was the Ascot dress from My Fair Lady. 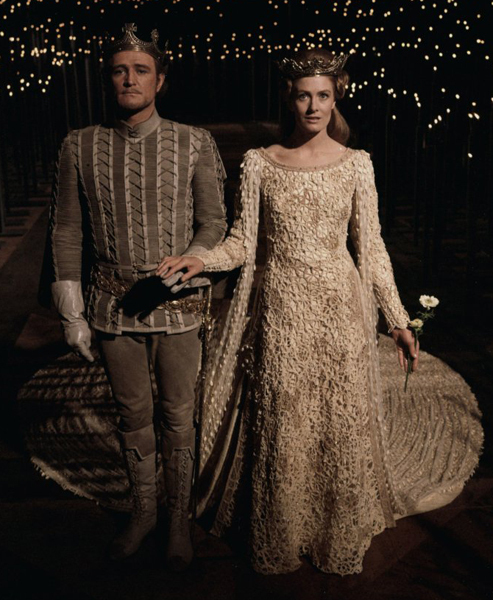 The second was Guinevere’s wedding dress from Camelot. The amount of detail sewn into that wedding dress was astonishing with unexpected components like seeds, nuts and grains sewn into a fine hemp netting. On a large screen these natural material would have glimmered like fine diamonds. On the small screen that is all lost, which is a pity. To hear you describe the costumes as “olde-timey sacks” does a great disservice to John Truscott whose Oscar for the film was well deserved.